Background: Reading disorder (RD) is one of the important complaints in children with learning disorders (LD) that is prevalent in 4% of children in the United States. Treating this disorder includes education of reading practices and treating psychological disorders, and there are no exact medications prescribed in these children. Memantine has been effective in treating memory problems in Alzheimer Dementia, obsessive–compulsive disorder, autism disorder, and other psychological diseases. 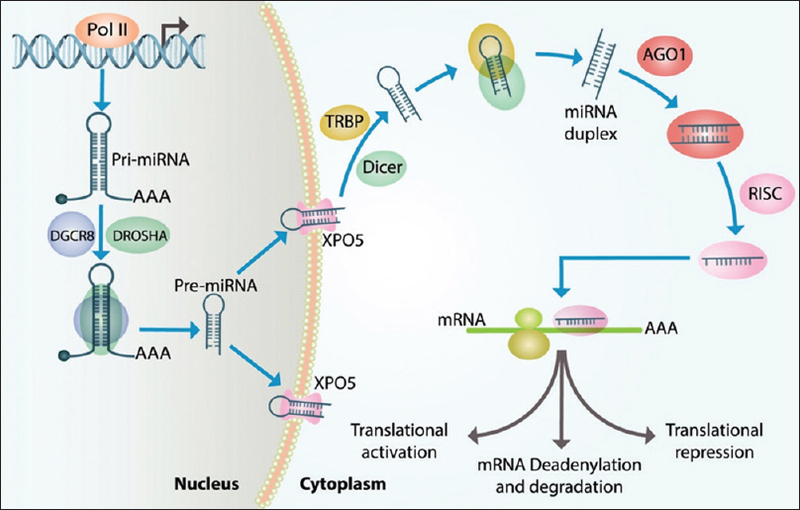 The aim of this study is to evaluate the effect of memantine in improving RD in children. Materials and Methods: In this randomized clinical trial, 62 children, with RD in Pediatric Psychiatry Clinics of Noor and Ali-Asghar Hospital in Isfahan from 2015 to 2016, were participated. They were randomly assigned to two groups of equal number, one receiving education plus memantine and the other education plus placebo. RD was evaluated at the beginning, 1 and 3 months after intervention by Iranian standard reading and dyslexia test (Nama). Results: Mean (standard deviation) age of participants was 7.55 (0.60) years. Most of the participants were boy (55%), most having parents in 36–45-year-old age group (52% and 48% for fathers and mothers, respectively), and also most parents in diploma and bachelor educational group (61% and 60% for fathers and mothers, respectively). There were statistical significant difference in trend of total score (P = 0.034), word chain (P < 0.001), rhyming (P < 0.001), text comprehension (P < 0.001), and letter fluency (P = 0.002), subscale between two groups. However, the difference of time trend between two groups was not significant in word reading (P = 0.14), word comprehension (P = 0.06), phoneme deletion (P = 0.12), reading nonwords (P = 0.32), and category fluency (P = 0.06). Conclusion: Adding memantine to educational practices is effective in improving RD in school-age children with LD. Background: Fuzzy logistic regression model can be used for determining influential factors of disease. This study explores the important factors of actual predictive survival factors of breast cancer's patients. Materials and Methods: We used breast cancer data which collected by cancer registry of Kerman University of Medical Sciences during the period of 2000–2007. The variables such as morphology, grade, age, and treatments (surgery, radiotherapy, and chemotherapy) were applied in the fuzzy logistic regression model. Performance of model was determined in terms of mean degree of membership (MDM). Results: The study results showed that almost 41% of patients were in neoplasm and malignant group and more than two-third of them were still alive after 5-year follow-up. Based on the fuzzy logistic model, the most important factors influencing survival were chemotherapy, morphology, and radiotherapy, respectively. Furthermore, the MDM criteria show that the fuzzy logistic regression have a good fit on the data (MDM = 0.86). Conclusion: Fuzzy logistic regression model showed that chemotherapy is more important than radiotherapy in survival of patients with breast cancer. In addition, another ability of this model is calculating possibilistic odds of survival in cancer patients. The results of this study can be applied in clinical research. Furthermore, there are few studies which applied the fuzzy logistic models. Furthermore, we recommend using this model in various research areas. Background: Chest tubes are used in every case of coronary artery bypass grafting (CABG) to evacuate shed blood from around the heart and lungs. This study was designed to assess the effective of Jackson-Pratt drain in compare with conventional chest drains after CABG. Materials and Methods: This was a randomized controlled trial that conducted on 218 patients in Chamran hospital from February to December 2016. Eligible patients were randomized in a 1:1 ratio. Jackson-Pratt drain group had 109 patients who received a chest tube insertion in the pleural space of the left lung and a Jackson-Pratt drain in mediastinum, and Chest tube drainage group had 109 patients who received double chest tube insertion in the pleural space of the left lung and the mediastinum. 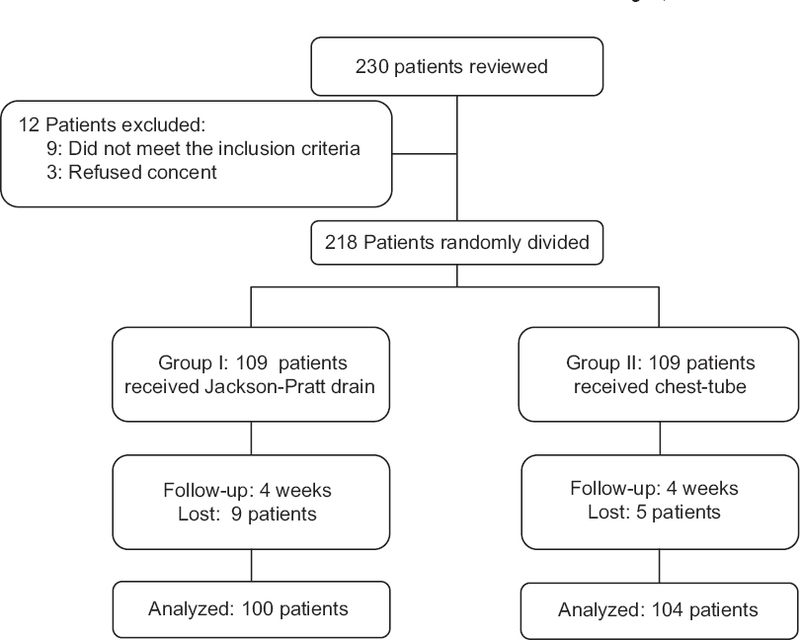 Results: The incidence of pleural effusions in Jackson-Pratt drain group and chest tube group were not statistically different. 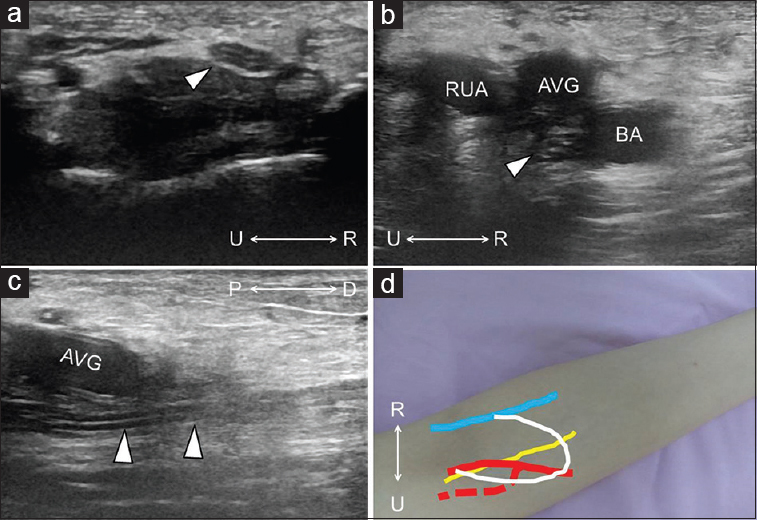 The pain score at 2-h in Drain group was significantly higher than chest tube group (P = 0.001), but the trend of pain score between groups was not significantly different (P = 0.097). 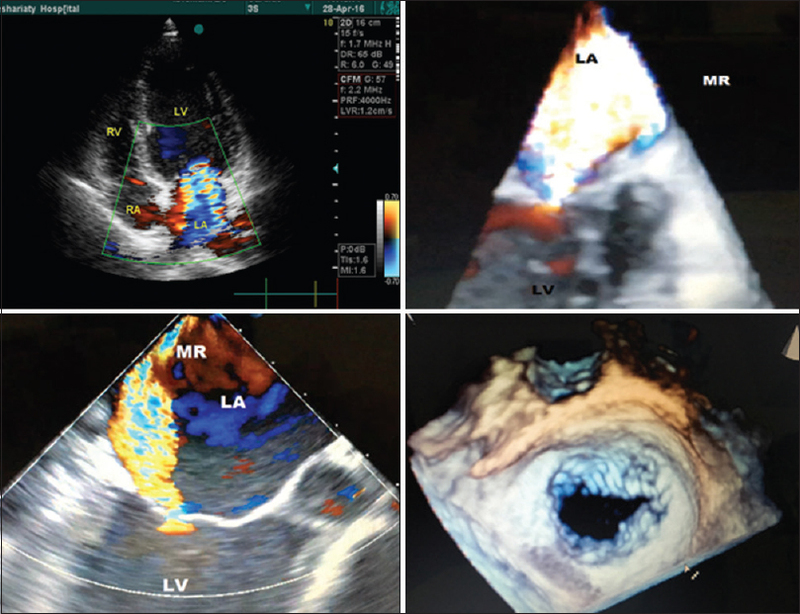 The frequency of tamponade and atrial fibrillation (AF) were significantly lower in Jackson-Pratt drain group (P < 0.05). Conclusion: The Jackson-Pratt drain is equally effective for preventing cardiac tamponade, pleural effusions, and pain intensity in patients after CABG when compared with conventional chest tubes, but was significantly superior regarding efficacy to hospital and Intensive Care Unit length of stay and the incidence of AF. Background: Premedication with orally administered benzodiazepines is effective in reducing anxiety and discomfort related to endoscopic procedures. 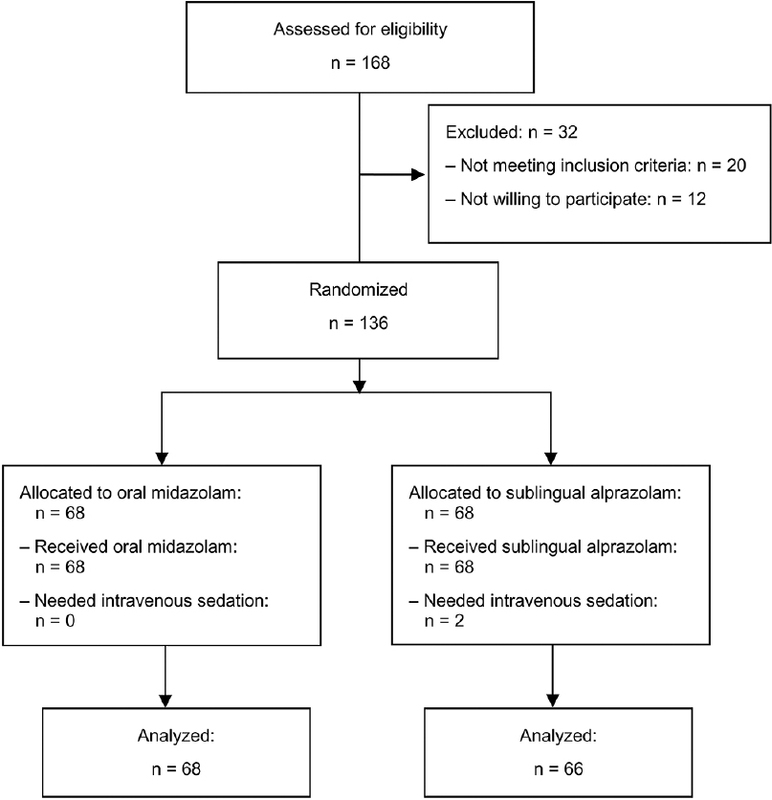 We evaluated the efficacy and safety of oral midazolam in comparison to sublingual alprazolam as premedication for esophagogastroduodenoscopy (EGD). Materials and Methods: Adult candidates for diagnostic EGD received either oral midazolam (7.5 mg in 15 cc apple juice) or sublingual alprazolam (0.5 mg) 30 min before EGD. Procedural anxiety and pain/discomfort were assessed using 11-point numerical rating scales. Patients' overall tolerance (using a four-point Likert scale) and willingness to repeat the EGD, if necessary, were also assessed. Blood pressure, heart rate, and arterial oxygen saturation were monitored from medication to 30 min after the procedure. 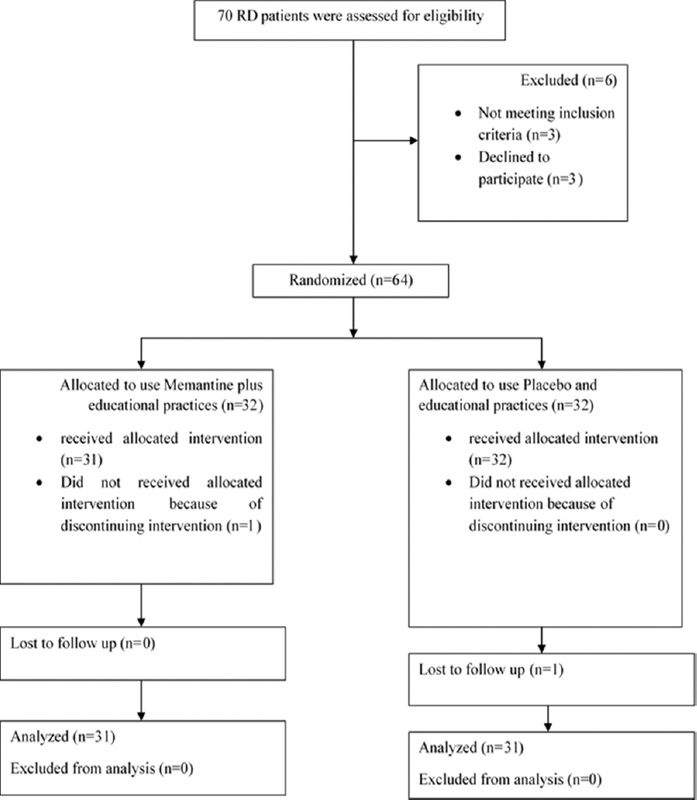 Results: Patients experienced a similar reduction in procedural anxiety after medication with oral midazolam and sublingual alprazolam; mean (standard deviation [SD] of 1.86 [1.63] and 2.02 [1.99] points, respectively, P = 0.91). Compared to oral midazolam, pain/discomfort scores were lower with sublingual alprazolam; mean (SD) of 4.80 (3.01) versus 3.68 (3.28), P = 0.024. There was no significant difference between the two groups in patients' tolerance, willingness to repeat the procedure, or hemodynamic events. Conclusion: Oral midazolam and sublingual alprazolam are equally effective in reducing EGD-related anxiety; however, EGD-related pain/discomfort is lower with alprazolam. Both benzodiazepines are equally safe and can be used as premedication for patients undergoing diagnostic EGD.